he British arts and crafts firms Morris, Marshall, Faulkner & Co. (1861–1875) and its successor Morris & Co. (1875–1940) are recognised as having produced some of the finest stained glass design of the late nineteenth and early twentieth centuries. A vital aspect of the firm’s artistic significance, stained glass continued to be a commercial mainstay of the business throughout its seventy-nine years of activity. As a result, Morris & Co. windows can be found all over the world: in New Zealand, most of these are in Canterbury. In the earliest years of the firm’s history, English artist Edward Burne-Jones (1833–1898) emerged as the most talented designer for the medium. Following his death in 1898, John Henry Dearle (1860–1932) became Morris & Co.'s principal stained glass designer. Trained by Morris, Dearle had risen to be the firm’s chief designer by 1890, creating designs for tapestries, embroidery, wallpapers, woven and printed textiles and carpets, as well as stained glass. 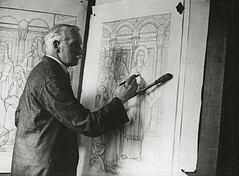 After the death of Morris in 1896, Dearle was appointed art director for Morris & Co. While most Morris & Co. windows in Canterbury are based on earlier designs by Burne-Jones, their overall schemes belong to Dearle, and all make explicit his genius and sensitivity for colour, for the organisation of pattern and space, and for strong, cohesive design with a distinctively Morris & Co. approach and feel.